Hike, shop, browse cool art galleries, hang out at the beautiful courtyard and enjoy the amazing New Mexico landscape with your new friends and THE DOGS! $48.00 per night at the Santa Fe Skies RV Resort. This includes all taxes. 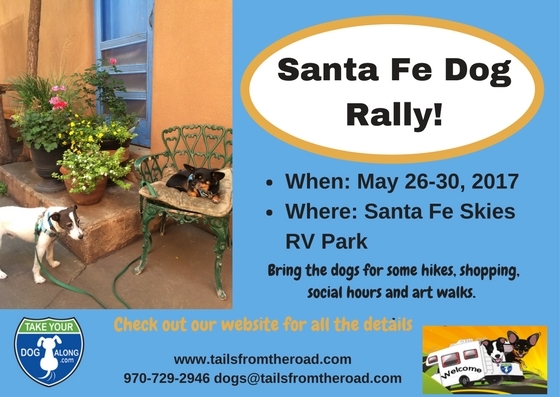 Book direct with the park (505)473-5946, tell them you are with the Take Your Dog Along Rally. $59.00 for the Rally – 4 nights and 3 days: includes 2 breakfasts and 1 dinner and 1 happy hour. $30 for additional person. 5:00 – 9:00 pm Walk the dogs on the park trail then bring the dogs to the Club House / Courtyard for a Fun Happy Hour with heavy apps. Free Day Since some of the fun things like the Santa Fe Farmers Market (no dogs allowed) and art markets happen on Saturdays, this first day you get to choose your activities and Juliet will check-in on your dogs or have them hang out with her at the campground, so you can have worry free fun. Shop, Walk and eat lunch in Madrid, a super fun town near by. Walk Dogs and hitch up and go – or stay! Ready to sign up? Here you go! What could be more fun? If you love to bring your dog along on activities and walks, this is the group for you. If you are staying with another group great! Stop by on Friday or Saturday, Jan 20, 21 after 4pm and hang with us for a bit. Bring your dog(s), a chair and something to drink. We’ll have some snacks and a fire as it gets dark. We would love to meet you! 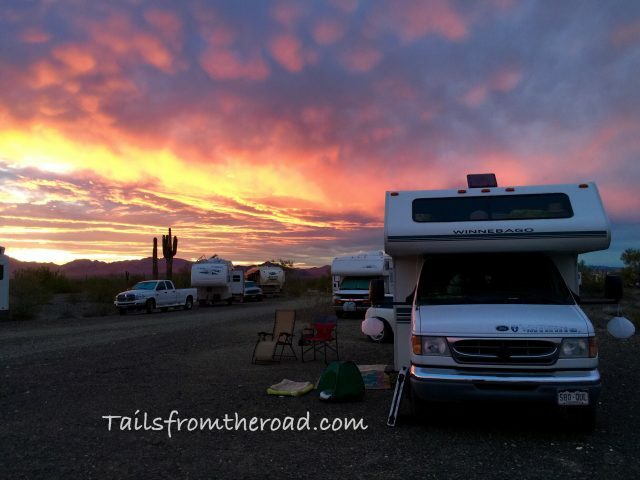 Join us in the desert outside of Quartzsite, AZ where thousands of RVers converge in the beautiful Arizona desert in January. 4 days of fun dog hikes, dog activities, fireside dog chats, shared meals. If you are new to Q, then this will be a great introduction to the whole environment. Q is only fun with like minded friends, so if you love to have fun with your dog(s), this this is the group for you. We’ll stop by and visit with other groups in the area and do a Quartzsite town tour together. If you are a veteran of Q, then you can join us then meet up with your other groups before and after or stop by and visit. Sunday the last day will be spent at the Big Tent RV Show in town. Provided for the weekend are fires each night (we will purchase firewood), group activities, hikes/walks, shared meals, parts of some meals, breakfast 1 day, dog activities and pure fun! Friendly dogs are welcome at ALL events! Got a burning question or issue with your dog? Juliet is a Certified Professional Dog Trainer, so bring those questions and she’ll help you out. This is dry camping – we’ll get you information on all that you need to bring. Location will be announced in December and confirmed in January. Directions will be available here and on the Members Only Facebook page. Come early and stay late if you want to, the group might decide to stay put or join another RV group in the area. On Januay 18th – The Escapee RV club (my favorite) will be hosting a Happy Hour 1-3, which I will be attending and bringing along anyone else that wants to come. Take Your Dog Along Members pay $0! This first Pet Venture is FREE! Yahoo! Membership is only $24.95, Join Here! 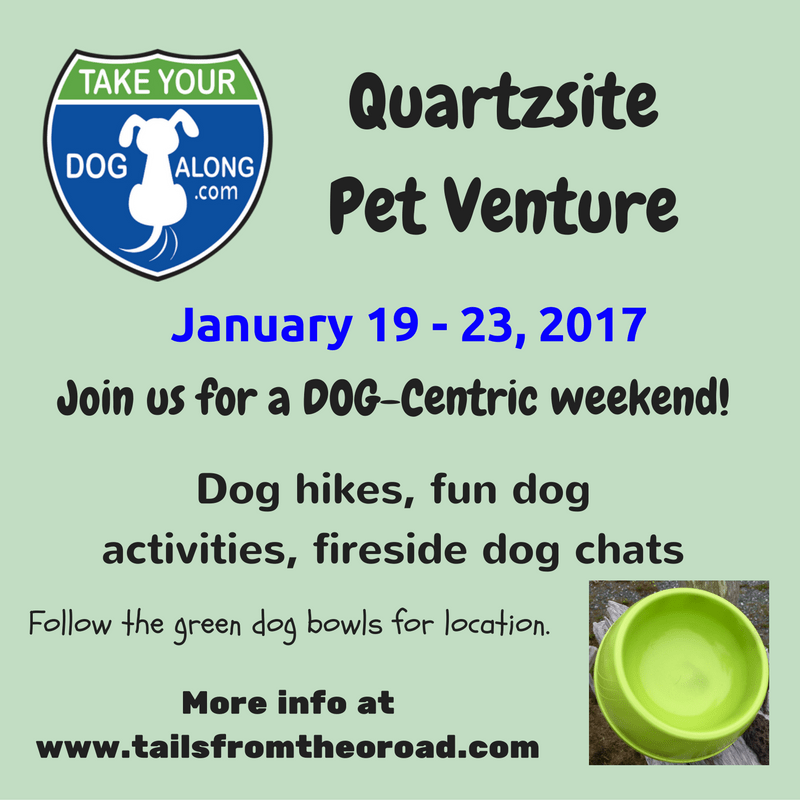 If not a member, you can use the “join here” button above, then add the Quartzsite PetVenture to your cart and check out all at once! details coming in Spring of 2017.